The 19th Century Industrial Revolution was one of the most glorious periods in human history, for the societies that took part--notably in America and Europe . Thanks to the intellectual groundwork laid a century earlier in both philosophy and science, the influence of governments was reduced at the very time when enterprise could develop key discoveries in medicine, chemistry and physics. As a result, life expectancy increased, as did populations, and simultaneously the quality or standard of those lives enjoyed unprecedented wealth--not just for the few but for great swaths of society. For centuries, the common man had lived in squalor; in the Industrial Revolution he emerged. Where not prohibited by law, he remains out. During the Summer break, I had the chance to explore one small example of the kind of enterprise that took part, when visiting Sweden ; I toured the world's only Match Museum . Although the machines and artifacts on show were fascinating, I was disappointed. It's in the city of Jönköping, properly pronounced something like "Yearn-Sherping," but persistently bastardized by the professional English voice in the museum's movie as "John-Sherping"; a glaring error that could have been corrected easily by five extra minutes of practice. That was the least of the many faults I found. The Jönköping Match Company was founded by the Lundström brothers in 1845, close to a lake shore in what was then a small town in a predominantly agricultural society. Their big innovation was of the safety match--one that would ignite only when struck on the abrasive strip provided, not on any old brick, stone or shoeleather. Demand boomed. Candles and oil lamps needed lighting, as did wood fires for warmth and cigars and pipes for relaxation, and the chemistry of the new invention gave them an edge. 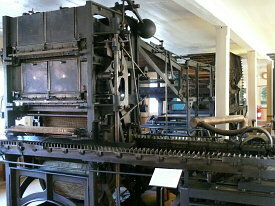 Production was at first divided between factory and home. Local residents could take in a batch of materials and assemble matchboxes and matches to fill them, and return the finished articles for payment under contract. Children could take part, of course, as they always had done as family members in corresponding farm work--but they drew no wage, unless from Pappa. Progressively the company drew the work in to the factory--and children with it. They were offered pay at a third of the adult rate, and that was gladly accepted. Museum visitors, however, are faced almost at once with the shocking revelation that the Lundströms employed children at low wages, and that prolonged exposure to phosphorus caused deformities of the eye, teeth and skin. What wickedness! We were also told that the low-cost, modern housing provided nearby was offered only to families whose every adult member was an employee of the company. What discrimination! Praise was reserved for actions of direct benefit to the community, such as making the company's state-of-the art fire department available outside the factory gates. The enormous indirect benefits it brought to the community were overlooked or perhaps just not understood. During the second half of the century, the company mechanized as much as possible (not least, so as to reduce that close exposure to the chemicals found to be so dangerous to health) and by 1892 its inventor and engineer Alexander Lagerman at last delivered a "complete machine" to manufacture matches from soup to nuts, ready boxed for shipment when supplied with raw materials--see my photo. Did this impress the museum designers and script writers? Not so much. Instead of just lauding that achievement, they showed us visitors the grievance of the new trade union that was formed to protest the associated layoffs and wage cuts, prominently displaying a printed Luddite wish, all the more blood-curdling for being in a Viking tongue, that the machine be thrown in the lake and its inventor be sent to Siberia. Such were the thanks the company received, after working so well to reduce its use of child labor, and such were the highlights of its history that are emphasized to 21st Century visitors. 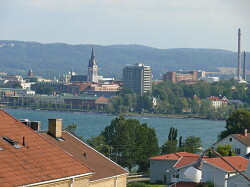 Jönköping Match was the foundation of that modern city, and by aggressive marketing of its products, it formed a prime example of Swedish industrial skill and worldwide enterprise. Yet those are not the impressions that would be gained by impressionable members of, say, a visiting school tour group. Just as in Ayn Rand's Atlas Shrugged, the heroes of commerce and the originators of widespread prosperity are despised and belittled. This was a capitalist success story, but it's being told by tax-funded peddlers of collectivist myth and political rectitude. I did notice that in the 20th Century, the company engaged in some disreputable behavior, though the museum did not pick it out as such. After WWI, there were mergers and acquisitions and control passed to one Ivar Krueger, who set out to monopolize the match industry in as many countries as he could. The method was to flatter each nation's political leaders by printing their portraits on all matchboxes sold, in return for "exclusive rights to market matches" in their domains. Naturally, every business dreams of cornering its market--not too much wrong with the desire, for it stimulates efficiency--but monopolies can be sustained only when laws enforce them, and the Swedish Match Co. (as the company became under Krueger) was corrupt enough to seek them just as the local Pols were corrupt enough to grant them. Krueger killed himself in 1932 after FDR had the Fed contract the supply of US money, so precipitating a worldwide depression. He need not have; demand for matches had inevitably contracted as gas and electricity replaced wood fires and oil lamps, but Swedish Match still survives and prospers, even if not with the burning success it used to have.